Once upon a time, there was a man named Bot Bong trying to find people to drink wine with him and looking for people to work for him as well. He searched from village to village but he couldn’t find one person to drink with him or work for him. Yet Bot Bong was actually a lucky man in the village. He met a beautiful woman who had a good reputation and was a good worker. That woman’s name was Yann and her mother’s name was Yaun so she was called Yann the daughter of Yaun by the villagers. When Bot Bong heard about this woman, he planned to ask her to work for him. So he asked her to dry sticky rice under the sun for him. A moment later, news of Yann daughter of Yaun was heard by the god, Tang Loy. Tang Loy went down to earth to capture Yann daughter of Yaun from her sticky rice drying place and brought her to the forest. Yann daughter of Yaun begged the god Tang Loy “please do not capture me, I won’t go with you. Please free me, I don’t want to be blamed by Bot Bong.” Tang Loy didn’t let her go but replied to her that: “I want to be with you, I love you and I won’t release you.” He detained her in the forest for 7 days and 7 nights. He kept her in a house in the forest where there was rice, food, water, cigarettes, betel and betel nut and everything they would need from the forest. They didn’t need to cook, work or look for anything because Tang Loy was a god who could create anything people wanted or needed. During the 7 days and 7 nights in the forest, Tang Loy had happily flirted with and seduced Yann daughter of Yaun without a care about her parents who were looking for her and waiting for her at home. On the last day, Tang Loy said to Yann daughter of Yaun that: “From now on I have stopped loving you and needing you.” So he sent her back home by herself. However, before sending her home, he told her that “if you are pregnant and your baby is a girl, please name her as Brom Brav but if your baby is a boy, please name him as Chhoung Bang.” Then he gave her a gong and said to her that “if you get labor pains, you do not need to call a midwife. You will give birth easily if you sit on this gong.” Yann daughter of Yaun agreed with Tang Loy and kept that gong with her. Then Tang Loy took her to where he had captured her and he went away. After she got home, her parents asked her “where have you been? Why didn’t we see you?” She replied to her parents that “I got lost in the forest and my body is very painful right now.” She didn’t realize that she was pregnant. Time went by and her belly got bigger and bigger. The time for giving birth had arrived. Yann daughter of Yaun began to get bad pains but she didn’t know that it was labor pains. When her brother saw Yann daughter of Yaun get pains like this her parents told him to find a traditional sucking healer. When her brother was on his way to find the traditional sucking healer, he met a wild chicken. So he told the chicken: “I am here to look for a traditional sucking healer because my sister’s belly is very painful. Chicken please help me treat her.” The wild chicken took out his magic pearl ginger and made a reflection on her history. After making that reflection, the wild chicken replied to him that “your sister has labor pains.” Then the wild chicken flew away. Yet the brother of Yann daughter of Yaun went ahead to look for another traditional sucking healer after the wild chicken had gone. He then met a crow and asked the crow to check what could be wrong with his sister. The crow replied: “I don’t know how to check.” Her brother continued to search for a healer and met many different animals but those animals were not able to provide help for his sister either. So then he decided to return home. When he got home, he told his two sisters to go find grandmother Nhi who was living at the other side of the river. Grandmother Nhi was a famous traditional sucking healer. He told the two sisters to carry a creel with them when they cross the river. The two sisters followed what their brother had told them to do. When they got to the riverside, they helped each other to cement their body with mud in order to make their bodies small so they could go in to creel. They went in to that creel and that creel flowed to the other side of river. The two sisters searched and searched for grandmother Nhi when they got to the other side of the river. 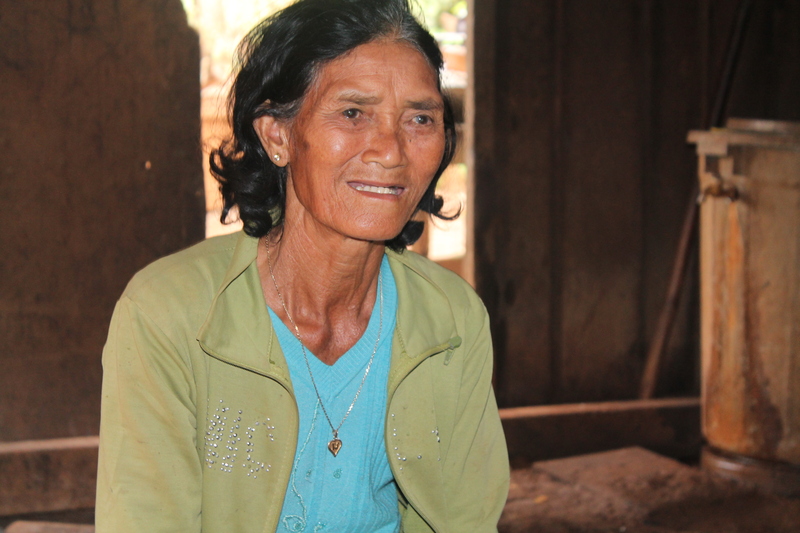 Finally, they met grandmother Nhi and asked her to see what was happening with their sister. Grandmother Nhi took her pearl out which was as big as a bamboo basket so that she could make a reflection. The pearl could also be useful to determine what had happened when Yann daughter of Yaun had disappeared for those 7 days and 7 nights. After her reflection into the past, grandmother Nhi told the two sisters that “your sister is not sick from any disease. She is in labor.” Then grandmother Nhi described the events that happened when Yann daughter of Yaun was captured by Tang Loy for 7days and 7 nights. Then grandmother Nhi told the two sisters to hurry back home and ask Yann daughter of Yaun about the events with Tang Loy and ask her to bring out the gong and turn it over. Then ask her to sit on the gong. It will be much easier for her to give birth that way. After that, the two sisters were in a rush to get back home to tell their parents about these events. They explained to their parents what had happened to Yann daughter of Yaun. After listening to the story, Yann daughter of Yaun’s parents asked her about the events and about the gong. Yann daughter of Yaun told her parents everything that had happened to her and she said that these things were true. Then she brought out the small gong that she had always kept with her and showed it to everybody. Afterwards she placed the gong down and turned it over. Suddenly, the small gong transformed to a big gong and she immediately went over to sit on it. Seconds later after she sat on the big gong, she gave birth to twin boys. She named the older twin brother Chhoung and the younger twin brother was named Bang. She called two girls in her village to help her look after Chhoung and Bang. She raised the twins until they were adults. One day, the two sisters who looked after Chhoung and Bang called to them and asked them to pick up Pschyabb leaves for them. The two sisters had tried very hard to collect those leaves but they needed Chhoung and Bang’s help. But Chhoung and Bang didn’t help them pick up leaves but instead they only played there. After the two sisters had finally collected enough Pschyabb leaves on their own, they called Chhoung and Bang to return home with them. Both Chhoung and Bang broke off a Pschyabb branch and put it into their bamboo baskets. Then they went back home together with the two sisters. When they got home Chhoung and Bang asked their mother to take a flat bamboo basket to put Pschyabb leaves on. They poured the Pschyabb leaves out from their small bamboo baskets onto the flat bamboo basket. Many Pschyabb leaves came out from their small bamboo baskets so that the flat bamboo basket became full of leaves. Chhoung and Bang then told their mother to distribute the leaves to all the villagers in their village. Their mother didn’t want to do that but she couldn’t convince them otherwise. So she went around giving out the leaves from home to home to all the villagers. When she got back home, Chhoung and Bang asked her: “did you give all the leaves out to all the villagers?” Their mother replied: “yes, I did.” But Chhoung and Bank knew that their mother was telling a lie. They replied to their mother that “there was a house where you gave no leaves to the people.” Their mother tried to convince them she wasn’t lying but they didn’t believe her. They were upset with their mother because she told them a lie. They cried and cried until their mother agreed to go back to that one house and give out the rest of the leaves. Chhoung and Bang were the sons of a god, and they knew and understood everything that that meant. That meant that people could not lie to them or cheat them. A day later, the two sisters called Chhoung and Bang again to go and help them to pick fruit. The two sisters collected lots of fruit but Chhoung and Bang didn’t care. They played while the two sisters worked picking up fruit. The two sisters picked enough fruit to fill a bamboo basket full of fruit. Then they prepared to go back home after they finished picking the fruit. They called Chhoung and Bang to go back home with them. So Chhoung and Bang each picked up a single cluster of fruit and put each cluster into their bamboo basket to prepare to go back home. When Chhoung and Bang arrived home they told their mother to take a flat bamboo basket to pour the fruit into. Then they told their mother to share all the fruit with all the villagers. Their mother agreed to go share the fruit with the villagers – home by home – but she skipped a house as she had done before because she was out of fruit. Then she returned home. When she got home, Chhoung and Bang asked her: “did you share all the fruit with all the houses, mother?” She replied to her sons: “yes, I did.” Chhoung and Bang knew that there was a house that had not received any yet. So they told their mother to bring more fruit from their own home to give to that house. So their mother took fruit to give to that family following her sons’ orders. A day later, Chhoung and Bang’s mother told them to go fishing with the two sisters. It was the same as before. Chhoung and Bang played while the two sisters were fishing. They only started fishing when they were called to go back home. Suddenly many fish took the hooks of Chhoung and Bang and were caught quickly and plentifully. Chhoung and Bang together with the two sisters collected the fish. Then Chhoung and Bang told the two sisters to share the fish equally with each other. They said “if you can manage to share these fish equally with each other, we will marry you but if there is a single fish remaining, we won’t marry you.” The two sisters tried to divide the fish equally but in the end 1 fish was left over. They hid that fish under the foot of one of the sisters then they told Chhoung and Bang that “we have divided the fish equally – there are no fish remaining.” However, Chhoung and Bang knew that they had hidden a fish under their foot so they told the sisters that: “there was 1 fish remaining, therefore we cannot marry you.” The two sisters were unable to convince them otherwise. Despite being mad with their father, Chhoung and Bang missed their father and wanted to see him. A few days later, Chhoung and Bang told their mother to prepare rice and food for them because they were going to find their father in the sky (the realm of the gods). They agreed to meet each other at the termite mountain. When they got there, they recited a magical phrase: “Trirak Nhit Tass A Mang Taung Ang Nhit Panh Ka Put Taung Ang Nhit Poarl Rea Nay Tum Por Chaung Pu Maung Ra Lass Ann Pling An Chyaung Baun Pri Yaung Voal Voanh.” Then, they saw a vision from the past of a place where their mother dried the sticky rice. After that they took off their shoes and arrived in the realm of the gods. They saw many houses but they dared not enter those houses of the gods. All of a sudden, there was a ridge-gourd spirit woman who appeared and asked them to visit her house. But Chhoung and Bang ignored her because they wanted to hurry ahead. They saw ridge-gourd, pumpkin, bean, rice, corn, gourd and rice spirit women. Those women called Chhoung and Bang to sit down and talk with them but Chhoung and Bang refused. They hurried ahead and then saw the house of a giant. Bang asked Chhoung: “should we enter this giant’s house who eats people”? Chhoung replied: “I will enter this house.” When they were both in the giant’s house, grandmother giant spoke to them and said: “don’t come to my house! If my grandchildren see you, they will eat you as their food.” They replied to the grandmother giant: “it doesn’t matter, grandmother. We only want you to cook food for us.” The giant grandmother said: “please leave right away because it is dangerous for you.” Chhoung and Bang replied: “there is no problem grandmother. Do not worry about us. ”Then grandmother giant prepared food for them. While she was cooking, Chhoung and Bang played with each other under a darkening sky. Then grandmother giant told them: “you may not be able to continue your trip. Please go into that jar to be safe.” At that moment, her grandchildren got home and heard her talking indistinctly. So they asked her: “who were you just talking with?” Grandmother replied: “no one. I was just talking to myself.” Then the giant grandparents went to bed. They couldn’t sleep well because they worried about Chhoung and Bang. When they first met their father, they didn’t call him by name. Instead they called him Tang Kaloas because they were angry with him. They didn’t say anything to their father; they just ran away after calling him by the name of Tang Kaloas. Ralem entered Tang Kaloas’s house when they got there and he said: “there are people here who want to see you.” Tang Kaloas came out and said “people who want to see me? What are you talking about?” Then Tang Kaloas walked over to see the two brothers. When the two bothers met their father, they gave him a tight hug. One brother hugged the left side and the other brother hugged the right side. After hugging their father, the two brothers told their father that “we miss you so much father, we have never seen you since we were born. We grew up with mother and grandmother only. We faced a lot of difficulties because we were insulted by villagers who said we were sons with no father.” Then, Chhoung and Bang asked their father to come back home to see their mother and grandmother. They said: “Father, we beg you to come back home and see mother and grandmother. They are waiting for us back home. They worry about us so much.” Tang Kaloas agreed to go back home. He told Ralem to prepare many things such as classical silk, clothes, rice, water and other supplies and put them in an elephant container for his wife and mother in law. They traveled day and night without stop because Tang Kaloas missed his wife and mother in law so much. So they rode their elephant quickly and didn’t care that their elephant was tired or not. They met a deer and a wild animaleating fruit while they were on the road but they didn’t kill those animals for food. As they traveled farther and farther, Chhoung and Bang said that they were hungry. They made the elephant stop to have lunch and let the elephant eat as well. Then, they ate rice, bananas and betel as it was their old tradition. Then they took cloth and silk to wipe the sweat off their faces. Tang Kaloas talked with his sons under the tree. While they were talking, the sons said “we will soon be in a thick forest and then we will be in our homeland after we pass this place.” After that, they started their journey again. They finally reached Chhoung and Bang’s homeland. When Tang Kaloas got to his wife’s house on the evening of their second day travelling, he made his elephant walk slowly. Then his elephant laid his trunk down near the door and you could hear the sound of his labored breathing. Chhoung and Bang called their mother and grandmother to come out and welcome them. When the mother and grandmother of Chhoung and Bang heard that, they came out to welcome them. Chhoung and Bang’s mother was very happy to see Chhoung and Bang and her husband back home and as well as the elephant and all the supplies they had brought. A day later, Chhoung and Bang’s grandmother and people in their village celebrated a traditional wedding ceremony for their parents and joyfully organized a solidarity lunch. They lived in happiness together and they lived and farmed just like other families. They had moved into paradise where the gods live. Their lives are now long lasting and they will never die. This entry was posted in Bunong Stories and tagged Bunong, Bunong story, Camboida indigenous, gods, indigenous people, spirit. Bookmark the permalink. What is the moral of the story.